How to heal that relationship. If you’re part of my ‘Ponders, Quotes and Questions‘ group you will already have seen this today, but I really wanted to share it with my subscribers too – especially with Thanks Giving just gone and Christmas around the corner. This is a time of year where good relationships get stronger and not so good ones can become even more tense and stressed. “If you’re struggling with a relationship in your life, rather than look at what’s going wrong, find something really right about it. Now see if there’s an opportunity to do more of that. PS: You can BUY yourself a copy of my BOOK, OR someone else (for Christmas? ), right here on Amazon: http://amzn.to/1ahfW7R (my listing is 2nd from top – it’s only £7.99 at the moment AND they’re brand new AND signed). This is November 28th of my book: ‘How To Change Your Life One Day At ATime‘. Take the opportunity today to do something differently. If you want to learn how to be more creative… read on. If you’re a creature of habit like me then doing things differently goes against the grain. I actually advocate in the strongest terms that making certain tasks habitual is integral to you getting them done. Having said that, by doing things a bit differently from time to time we step out of the boredom of routine, we engage our minds and our creativity and we give ourselves the opportunity to find a new way. A better way maybe. By doing this often we may find that the way we are doing something is the best way – so we get reassurance. But we may find new interesting, time saving, stress relieving ways that would otherwise remain unknown. Engage someone else in this process and your combined efforts may reap rich rewards. You’ll only know by trying. New studies also suggest that by doing an everyday task differently just before you want to do something creative actually improves your creative faculty. Try it. PS: You can BUY yourself the BOOK, OR someone else (for Christmas? ), right here on Amazon: http://amzn.to/1ahfW7R (my listing is 2nd from top – it’s only £7.99 at the moment AND they’re brand new AND signed). A great way to take your mind off life’s stresses. How to stop being judgemental. Learn how to tap into your own powerful intuition. This is November 26th of my book: ‘How To Change Your Life One Day At ATime‘. Take the opportunity today to imagine you could talk with anyone from history. What would you ask them? Can you imagine how brilliant that would be? Anyone at all. Ask them anything. What would you ask? More importantly, how would they answer? That is the point of this exercise. Allow your subconscious to decide how you think that incredible person from history would answer your question. Spend a minute with your eyes closed just remembering everything about ‘that’ person. What they stood for and believed in. Why you admire them so much. Imagine how their voice would sound. Then, get a pad, write your question down, then sit for a while imagining in as much detail as possible that person from history answering. Write their answer under your question. Write it as quickly as possible – ask them to slow down for you if you need to, they will. But capture their answer as quickly as it comes so that your own mind doesn’t try and filter or censor it. This is a great way to tap into your own wisdom and intuition. How to change your point of view. This is November 23rd of my book: ‘How To Change Your Life One Day At ATime‘. Take the opportunity today to play Devil’s Advocate. Anyone that knows me knows this is my favourite standpoint. Not because I want to be obstinate. It’s because I think the most interesting debates happen when not everyone is in agreement. I take the Devil’s Advocate standpoint when I do agree – just to open the discussion to alternate ideas. From this standpoint it’s only a small step to consider changing your belief about something too. This can become quite heated so put your diplomacy hat on. How to BE who you want to Be. This is November 22nd of my book: ‘How To Change Your Life One Day At ATime‘. Take the opportunity today to contemplate your Be-Do-Have paradigm. “Most people started out (I know I did) with the understanding that how life worked was like this: Have-Do-Be. That is, when I HAVE the right stuff, I can DO the right things, and then I will get to BE what I want to be. Example: When I HAVE enough money I can DO the thing called buy a house and I can BE the thing called secure. Want one more? Here goes: when I HAVE enough time I can DO the thing called take a vacation and I can BE the thing called rested and relaxed. I have paraphrased the above due to the room I have, but essentially life works: BE-DO-HAVE , that is – BE what you want by DOing what you want and you will end up HAVing what you want, not HAVE-DO-BE. Look at your life to date this way, and see what you recognise. Do you see a cube frame? Interesting visual illusions like the Necker Cube above give us clues of how our senses perceive the outer world. 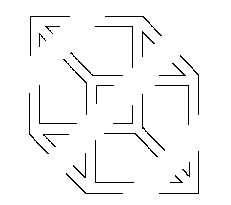 You probably see a cube framework with three white bands crossing in front diagonally. It’s all to do with perspective. If you squint it’s easier. Once you see it ask yourself: Is the nearest face to the bottom right or top left? People will see this differently. So, are we doing this on a psychological level too? Are we seeing things differently to others? Are we experiencing events differently to others? If so, what’s true? Whose truth is true? Change your perspective, look at things differently, and see what a difference it makes to your experience. To enjoy more of these visual illusions click here. PS: Grab yourself, or someone else, a copy of my book “How To Change Your Life One Day At A Time” right here on Amazon: http://amzn.to/1ahfW7R And change your perception on life. (My listing is 2nd from top – it’s only £7.99 at the moment AND they’re brand new AND signed).